Located at Kapiolani Park, Diamond Head Ambassador is near the water fountain made famous by Hawaii Five-0. 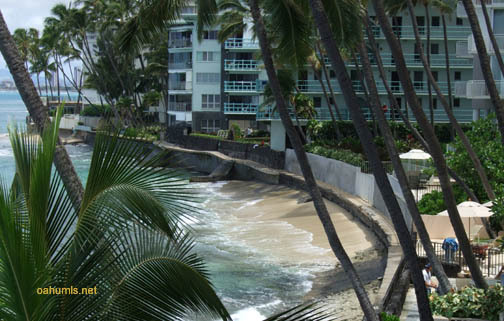 Imagine, relaxing on your lanai watching the waves and then taking a morning walk in the park. It's hard to think of a neater condo to be in along the beach. 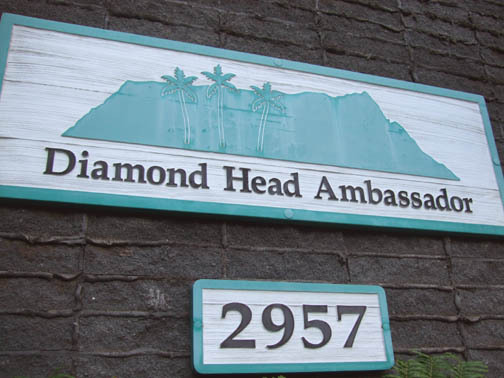 Diamond Head Ambassador is a fee simple co-op. There are a total of 92 residences here. The residences are spread across three buildings, each of them six stories tall. The buildings are connected by concrete bridges with wood railings. This property is definitely an eye catcher! Most of the units are one and two bedrooms, with interior area ranging from 443 to 965 square feet. Some of Diamond Head Ambassador's amenities include a swimming pool, storage room, a meeting room and recreation area. Maintenance fees include hot water and electricity.